Here's a separate Microwaves101 page on the MIMIC program (1987-1995). Note: although it is our intention to keep this page up to date, it is next to impossible as Darpa's website is a moving target. So expect a few broken links below! 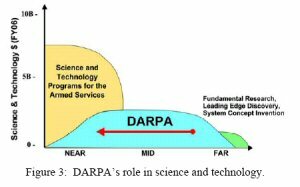 Here is a link to Darpa's archived programs. It is far from complete but you can search by program office or topic. Why do we keep writing "Darpa" instead of "DARPA"? The latter is more correct, but it seems like shouting. You would not spell "radar" as "RADAR", right? Go to our download area and get a copy of DARPA's 2015 strategic plan. 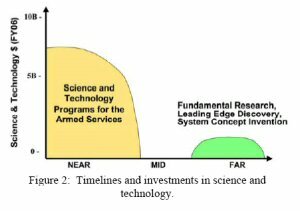 Here's two figures from the plan that illustrate DARPA's role in technology, if you've been to a DARPA presentation you've see these charts no doubt! Here's Darpa's Strategic Plan, circa 2015. If there is a new version, let us know! On this page we will describe some of the DARPA programs past and present that are used to advance the state of the art in microwave engineering, here in the United States. DARPA only takes on far-out jobs that are high-risk/high payoff, which has led to the expression "DARPA hard", meaning a problem that is gonna take your best guys some time (and beaucoups dinero) to figure out. 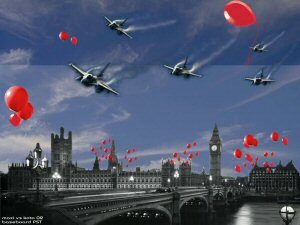 Increasingly their mission has changed to taking cool technology into the field, rather than pure research. Note: most of the information on this site was gathered from the darpa.mil web site. You can rest assured that nothing on Microwaves101.com is in violation of the International Traffic In Arms Regulations (ITAR) . DARPA's 2017 budget was $3.3B, and it has remained relatively flat over the years. The President's FY2018 budget request for DARPA is $3.17B. The FY2017 budget request was $2.97B. We'll wager a guess and say that somewhere in the neighborhood of $100M of DARPA's Wallet o' Warbucks goes to develop microwave hardware each year. You are welcome to sift through hundreds of pages of funding here to form your own analysis. DARPA stands for Defense Advanced Research Projects Agency. It one point the removed the word "defense" from their name and DARPA became ARPA, but that sounded like a noise that a sick manatee might make so they went back to the original moniker. DARPA was formed in 1958, shortly after Sputnik was launched, so the US would not be caught by any other surprises. It's original focus was to get the US on track in the Space Race, but over time it has evolved into much more. DARPA programs have made some of the major advancements in technology that the modern world depends on. For example, the internet was once the ARPANET. 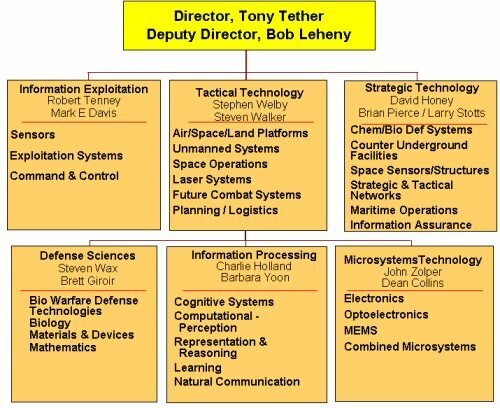 Some of the technologies that were transitioned from DARPA to useful military and commercial products are described on the DARPA site's About Us page. This includes the SR-71 blackbird, early phase array antennas, the M-16 rifle, satellite navigation systems (which led to the global positioning system (GPS), the Saturn V launch vehicle that put Apollo astronauts on their way to to the Moon, and stealth fighter bomber and navy vessels (Sea Shadow). By the way, read here the real quote about Al Gore "inventing" the internet. In terms of microwave engineering, DARPA was responsible for the huge cash injection that made MMICs into a profitable industry in the United States (for at least a short time). The "MIMIC" program dumped wheelbarrows of cash into GaAs foundries across the country from 1988 to 1999, each one working on different microwave chipsets that would support defense-related hardware such as T/R modules and EW receivers. Many older microwave program managers get misty eyed when they think back to these exciting times, but these dudes gotta stop living in the past... comments that start with "I remember on the MIMIC program" have no real relevance today, that was two wars ago. Later programs such MAFET (Microwave and Analog Front-End Technology) achieved further cost reductions in MMICs. DARPA issues a variety of "challenge" events, such as the Cyber Grand Challenge (a competition to create automatic defensive systems capable of identifying and fixing software flaws in real time), the Service Academies Swarm Challenge (encouraging military students to develop innovative offensive and defensive tactics for swarms of small UAVs) and the Robotics Challenge. Right now, they're in the midst of the Spectrum Collaboration Challenge, offering a prize of US$2,000,000 to the team that develops a radio design that most reliably achieves successful communication in the presence of other competing radios. "Exploit breakthroughs in materials, devices, circuits, and mathematics to develop beyond leading edge components with revolutionary performance and functionality to enable new platform capability for the Department of Defense." For some reason this office used to love MEMS technology, but we're not convinced. Past programs include 3-D Micro Electromagnetic Radio Frequency Systems (3D MERFS). This is a cool program that seeks to make rectangular coax cheaply, using printed wiring board technology. The contractors were Rohm and Haas (now Nuvotronics), and BAE. Who's your Papa? Check out our page on rectax to lean more about this topic! A second contract on teh same subject was called Disruptive Manufacturing Technology (DMT). WBGS2 Wide Band Gap Semiconductor was a cash injection for those US foundries that were pursuing gallium nitride (GaN) and/or silicon carbide devices. IRFFE means Intelligent RF Front Ends. This program sought to build devices that can operate across wide frequency bands, by self-tuning to the desired frequency. Low loss switches are used to move matching circuits to optimize at different bands. This is NOT a trivial problem, but no DARPA project starts out trivial! SMART Scalable Millimeter-Wave Architectures for Reconfigurable Transceivers wanted to develop 3-dimensional MMIC technology so that power amps can fit into the lattice spacing of a phased array antenna. Northrop Grumman and Rockwell each owned part of this program. RF MEMS Improvements (RF MEMS). DARPA was one of the early sponsors of MEMS work. The COSMOS program was an attempt to marry several semiconductor technologies onto the same substrate, like silicon CMOS and InP HEMT. A follow on program, DAHI, is still going on, here contractors had to step up the game and add yet another technologu to the mix. The NEXT program brought sub-100um gates to GaN technology, moving its maximum frequency well beyond 110 GHz and spawning collateral developments such as respectable GaN low noise devices. DARPA's RF-FPGA program worked to make reconfigurable hardware a reality, with low-loss switches used to change networks on the fly. One outcome of this program was the emergence of RF chalcogenide switches to replace MEMS. HiFIVE sought to talke vacuum electronics into millimeterwave frequencies (220 GHz), in imniature form. Current programs include ART, or adaptive RF technologies, which seeks to produce adaptable RF front-ends that can be applied to 30 MHz to 30 GHz. VISAR is developing a radar at 220 GHz to see through clouds. Arrays at commercial timescales (ACT) aims to make phased arrays less expensive to develop. ICECool is working to unlock the thermally-limited potential for GaN amplifiers using exotic heatsink technologies. CONverged Collaborative Elements for RF Task Operations or CONCERTO, focuses on supporting communications, radar, and EW systems with a flexible RF architecture that uses shared common hardware. Darpa MADFIRES (Multi Azimuth Defense Fast Intercept Round Engagement System) is working on adding RF sensors to hypervelocity, high-G-launch weapons. The idea is to replace missiles with guns. The CHIPS program (Common Heterogeneous Integration and IP Reuse Strategies) hopes to make re-use of intellectual property as building blocks. This is a new program for 2017. MIDAS is making working towards digital beamfering, multi-beam phased arrays at millimegterwave. As of 2018 it is just getting started. If there is a theme at MTO, it is reconfigurable hardware. When are they going to put some real money into tunable filters? a second them is stretching the limits of semiconductor technologies (and/or combining them). STO was formed by merging the Advanced Technology Office (ATO) and the Special Projects Office (SPO). 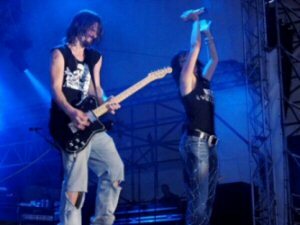 This happened over the summer of 2006. This is another organization worth watching for microwave-related work. Hielten sich fuer Captain Kirk, sas gab ein grosses Feuerwerk! Here is the direct translation of the song from German! Low cost cruise missile defense (LCCMD) developed a Ka-band AESA (an active phased array). This program originated in the SPO and then moved to STO. While intestinal fortitude may no longer be an active program, DARPA does conduct research into Bio-electrical interfaces.